Does your bedroom regularly become full of clutter? Our home seems to generate a huge amount of clutter and paraphernalia usually from the children and the one place it tends to land is in our bedroom. There are usually piles of clothes waiting to be put away, bags and shoes lined up on the floor, and lots of paperwork waiting to be filed. The bedroom also serves as my office and I try to keep the desk clear but it’s not always easy. So I am always looking for ideas and solutions on how to keep the bedroom clutter free so it feels more spacious. I thought it might be nice to write out a few of my ideas as they may be helpful to some, and then if you have any more I’d love you to add them in the comments. Let’s see if we can really sort through the clutter and create a streamlined, spacious bedroom in which we can relax at the end of a hard day. 1. Ensure you use every corner of the room if you have a small one. Look upwards and use shelving above the doors or storage boxes on top of wardrobes. I love this idea below where every single nook and cranny is used in this closet to really make the most of the space. I also love the way that the door could be closed and whatever the look of the closet it won’t be seen from the bedroom. 2. If your room is very small think about maximising every part of it. One way to do that is to use sliding wardrobe doors which won’t encroach on the room when you need to access your clothes. I love the idea of doors like this and think they look extremely sleek and elegant too. 3. Now I’m not sure I could live with this but this could be a great idea to suit some bedrooms. 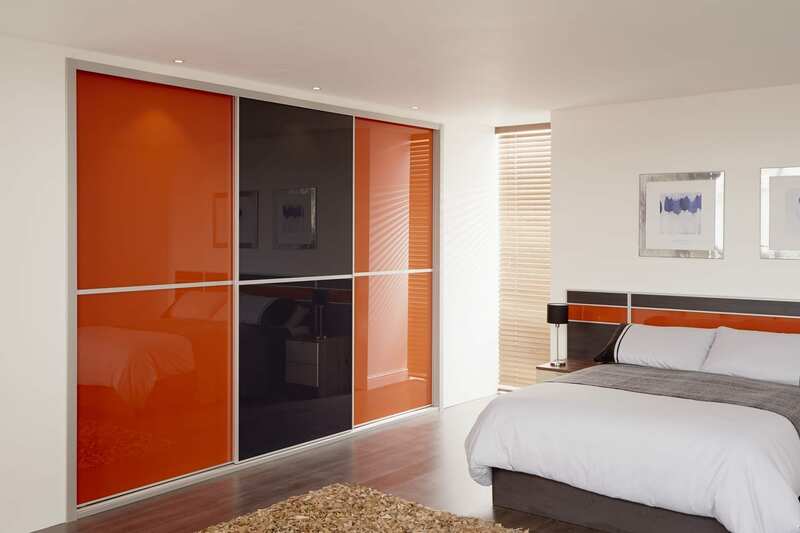 If you don’t have space for a wardrobe create a bespoke ‘headboard’ by using a modular hanging unit behind the bed. Obviously you’d need to ensure you had full access to it but this could really work and look very stylish. 4. Keep the colours calm and neutral because sometimes what you need to create is the illusion of space, particularly in a small bedroom. 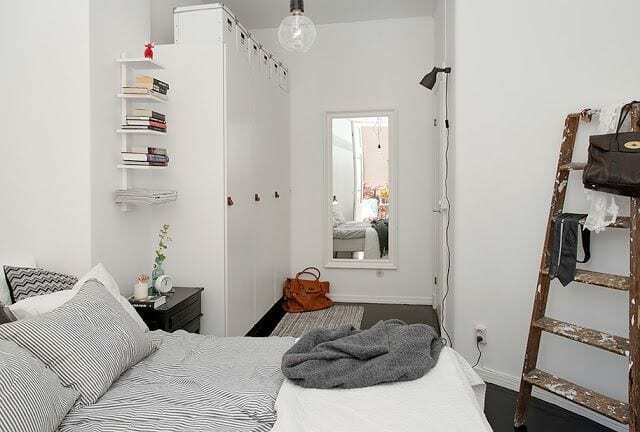 Look at how keeping everything white and having lots of storage makes this small room seem very streamlined and spacious. 5. Maybe, like me, you’d like a desk or dressing table in your bedroom but don’t have the space. Never fear, there is always a solution as this drop down desk idea shows you. This could easily be used a dressing table with a mirror on the wall, and makeup storage from the floor. Then when it’s not needed the whole thing can be folded away. Genius! 6. And finally, whilst we’re on the subject of dressing tables, how about this gorgeous design maybe for a guest room. If you don’t have much space and want to incorporate a wash stand, look at how brilliantly this neat corner cupboard design works. 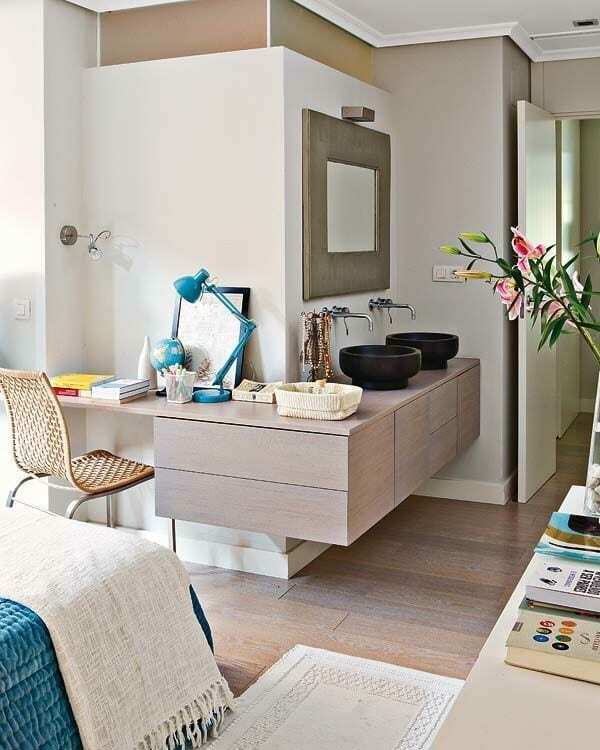 Extra storage, a dressing table and two sinks all along a previously redundant space. So I do hope you like these suggestions and ideas for keeping you room clutter free and creating a much more spacious sleeping space. There are lots of ways to make the most of your space, and sometimes all it needs is a little inspiration. 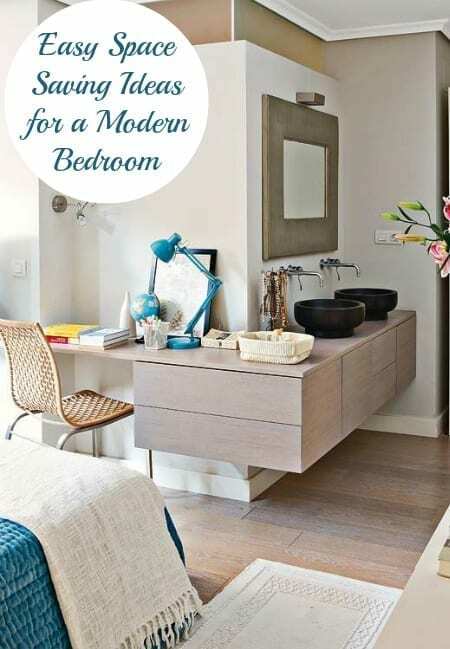 What about you, do you have any space-saving ideas for your bedroom? I think we would really benefit from sliding wardrobe doors in our bedroom, it’s a tight squeeze at the side of the bed currently since we ‘downsized’ our room to let the kids have the bigger room. I wonder how they are to fit? Probably fairly easy, I guess it’s just a couple of rails that the doors roll on. Hey! I have a small room and this helped sooooo much! I am looking forward to designing it with all these great ideas!